See how a furnace or air conditioner rental in Winnipeg can keep your home comfortable, save you money, and give you total peace of mind! Winnipeg is no stranger to cold temperatures, as its inland location in the Canadian prairies gives it a humid continental climate and often harsh winters, despite its high amount of annual sunshine. The Gateway to the West is a beautiful city with vibrant culture, but to live here, homeowners need top notch heating (and cooling!) to survive in this challenging climate. Of course, residents turn to high-efficiency furnaces and central air conditioners to offset the cold and heat but these appliances can be expensive to upgrade or replace. We want the citizens of Winnipeg to know that one of our main goals is to make efficient, eco-friendly and dependable home heating and cooling available to as many residents as possible. Before you start shopping for a new AC or furnace to buy, consult with one of our experts who will be glad to tell you everything you need to know about what type of unit will work best in your home and our amazing rental program that can save you tons of money. 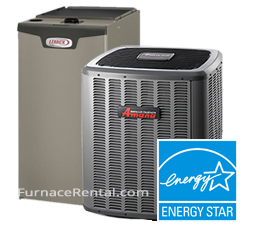 The savings begin right away when you rent a furnace or AC from us. We offer a rent to own program that is loaded with features and benefits to make your life easier and save you money. Free Installation – You probably already know that the installation of a furnace or AC can be almost as expensive as the unit itself. And it obviously needs to be done right! We don’t believe that solid installation should come at a premium however and thanks to our flexible rental program we take care of everything! Easy Approval ­– Depending on your credit you may have already heard some unrealistic financing terms for your HVAC appliance purchase. As long as you’re the homeowner, we can almost always approve you and since you are renting and not buying, everything is built into one simple and affordable payment. Save Money on Maintenance – Maintaining your furnace or air conditioner can be very expensive as well but it is still of vital importance if you want to get the most reliable and efficient heating and cooling. We know how important servicing your unit is so we offer 100% free service calls whenever you need them. As part of our rental program you will be entitled to unlimited service calls as long as you have one of our units installed in your Winnipeg-area home. Plus get a free annual multi-point inspection! These are just a few of the ways that our rental program can save you tons of money every year. You can talk to us any time to find out more about how renting can benefit you and your wallet. Have you taken a close look at your energy bill lately? Have you noticed that it has been higher than you might like? This can be due to your inefficient and outdated furnace. Upgrading to a high-efficiency, ENERGY STAR-certified unit can not only do a better job of effectively and uniformly heating your home, it can save you up to 40% on your heating costs, depending on how old and inefficient your current unit is. We have a full range of late model furnaces that offer upwards of 98% AFUE ratings which can translate to big annual savings on your utilities. We have forced air furnaces that offer high AFUE rating and high BTU output to heat Winnipeg homes of any size. Even if your furnace is not totally broken down it may be far enough along that it will still not even be worth it to repair. The last thing you want is a furnace that’s on its last legs breaking down in the middle of January with Winnipeg likely temperatures well below zero. Upgrading through our rental program can save you from unexpected, inopportune and expensive repair or replacement costs. If all of this sounds good to you don’t worry because the process of renting with us is equally as easy as it is money saving. All you have to do is give us a call and we can get the process started. Our specialists will walk you through the process and all you have to do is set up a date for installation… sometimes as soon as the very next day! We will walk you through the monthly rental fees, your buy-out options and the services that you are entitled to by renting with us.